‘Tis the season to be…eating! Here are some calorie-free cookie stories. These brief cookie stories are seasoned with facts about libraries. The sources for the research are in this A.L.A. reference book. I see that when this post appeared, it wiped out information from earlier this month on the problem of e-books prices and conditions so that libraries can offer them. Please also go to my post, "Smart Cookies Read." Facts like: 58% of adults in the U.S. have public library cards. In my illustration,I love the dreidel cookies along with the other holiday cookies. Dreidels are tops, often homemade, and are traditionally played at Hanukkah. Here's a virtual dreidel you can play by yourself. This is the song traditionally sung about dreidels. These jolly fellows stick to the part about the clay dreidel. On YouTube you can find other verses added to make a longer song (also parodies). It’s not traditional, but you may enjoy the expanded versions. 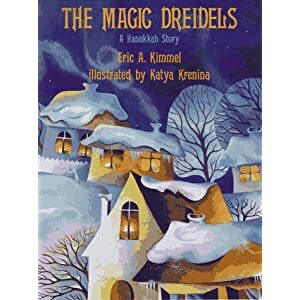 Similarly storyteller/author, Eric Kimmel, often expands folklore to make original stories like his The Magic Dreidels. I’m not sure if dreidel cookies are traditional, but I am sure that Americans go to school, public and academic libraries more than three times more often than they go to the movies. Elijah tales are traditionally told, especially at the various Jewish holidays, as he is found in the Talmud, folklore, and even in Islam and other faiths. Foodies should love hearing about his taking refuge from King Ahab by staying with the Widow of Zarephath. He's an uninvited guest who wants food. There's not sufficient food to keep her and her own son alive! Elijah tells her God won't let their supply of flour or oil run out. She feeds him the last of their food, and Elijah's promise miraculously comes true. There's more in 1 Kings, especially chapter 17, but that and his being taken bodily up to heaven in 2 Kings 2 led people to set a place for him at feasts in case he should appear. . . so save some cookies. There are more public libraries than McDonald’s in the U.S. – a total of 16,766 including branches. Another religious figure for this time is St. Nicholas. In the U.S. we condensed his name from Sinterklaas to Santa Claus and his red suit comes from the red robes of a bishop. 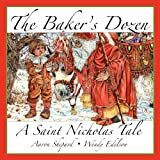 St. Nicholas was a bishop known for his generosity to the poor, especially tossing three bags of gold over the wall into the yard of three sisters for marriage dowries, saving them from probable prostitution. His feast day is celebrated on December 6. 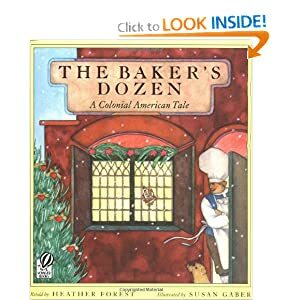 In the colonial days of the U.S. it is said that in Albany an expert Dutch baker named Van Amsterdam was known for his Sinterklaas cookies until he upset an old woman. She asked for a dozen. He gave her 12, but she insisted on 13. When he refused, she rebuked him for his lack of the saint's generosity. A year passed and nothing he baked was worth eating. By the following Dec. 6 he had just enough to make his trademark cookies one last time. Some say in a dream the saint talked to him about generosity, so when the woman reappeared he gave her the extra 13th cookie forming the first Baker's Dozen (and restoring his baking abilities). Americans spend nearly three times as much on candy as they do on public libraries. Of course Gingerbread Cookies don't have to be made as Gingerbread Men or made into Gingerbread Houses, but there are so many wonderful versions. 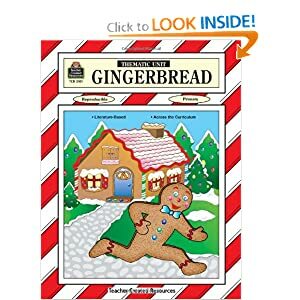 If you feel sorry that the cookie gets eaten, why not try the tasty illustrations and two versions by Jan Brett, the Gingerbread Baby and Gingerbread Friends. I also noticed a Gingerbread Thematic Unit by Daphne Ransom. Haven't tried it yet, but it's an appetizing idea. Americans spend over 18 times as much money on home video games as they do on school library materials for their children. For baking cookies and more, I’m also reminded of the Scottish tale about the Woman Who Flummoxed the Fairies. When fairies kidnap a fabulous baker she insists they bring her the ingredients, then the utensils and other tools, then her purring cat and snoring dog because it helps her mixing rhythm, then she's too worried to bake properly without her husband and baby. She whispers to him to step on the cat's tail. Cat yowls, dog barks, baby cries, husband shouts for dinner and fairies send her home because of the noise, but from that time on every week she leaves baked goods (o.k., we’ll say just cookies) on the entrance to the fairy mound for them. They pay her handsomely, but never again try to keep her a prisoner. I love telling this as an audience participation tale, but there’s also a picture book version and once again it features retelling by Heather Forest. Americans check out an average of more than 8 books per year, but their per capita tax cost is about the cost of an average hardback book. While thinking about cookies and the various religious traditions, why not also include the “wise fool” character loved throughout Islamic countries? While he's spelled many different ways and also goes by many names, I especially enjoy the Turkish versions about the Hodja as they often include a bit of historical background. Timur (sometimes called Tamerlaine) makes the Hodja his new tax collector. The previous collector had to eat his receipts since they were unsatisfactory to Timur. The Hodja has his wife make thin cookie dough and writes his records on them, making it better later than eating paper. There are many anthologies and online stories about the Hodja. (Don't stop with just the one online source linked here as he has many fans and his stories appear in many places.) As for books, my first exposure came from the works of Alice Geer Kelsey and Barbara Walker, but, like cookies, I didn't stop there and I hope you don't either. Taxes may not be tasty, but here's a library value calculator, showing libraries are a bargain, so pass the cookies and enjoy these sweet cookie stories by borrowing them from your local library.